RAD Manufacturing is our newest supplier of custom wheels. They make their own hubs and will build that custom set of wheels for your KTM 950/990 Adventure, 950 Super Enduro and 690 Enduro any way you like it. From stock sizes to full Supermoto 17s they have what you need and we are happy to help you bring life back into your KTM. Did we meantion that with all of the color options available they can be your own creation. This doesn’t mean they don’t use the strongest lightest possible parts for their sets. Don’t be confused. When you need to replace those old worn out stock wheels look no further. We are here and we will be happy to help you make those dreams come true. Cox Racing is known in the AMA pits but did you know that they make some of the strongest and lightest radiator protection out there. 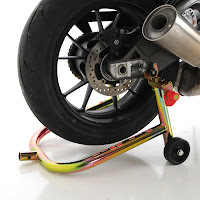 Did we also mention they are the only manufacturer of Radiator Guards for the KTM 990 Supermoto’s and RC8/RC8R. If you have either of those bikes do yourself a favor and protect that radiator at all costs. If you don’t then you will be spending allot more money then what they are asking for one of their units. Guaranteed! Full Spectrum is another name known around the professional racing circuit and for good reason. They make the best Lithium Batteries out there. US manufactured and professionally tested their batteries are the next evolution in battery design. Voted Best Racer Product of 2010, their units are currently being used on Makita Yoshumura Suzuki, Celtic Racing, LTD Racing, Monster Energy Kawasaki and Factory KTM. If professionals trust their racing to Full Spectrum then maybe you should too. Their P3 Battery is a upgrade for the 950/990 Adventure and their P2 is a current replacement batter for every bike we cater to. With an average weight savings close to 7 pounds over the stock unit you get the best of both worlds. Finally here and in stock for all of your 690 junkies. DynoJet’s Power Commander is fine tuned and race ready with all of your KTM 690 riders in mind. Put that bike on the dyno and add all of the parts you have been afraid of adding because the magic box is finally here and ready to finalize that project of yours. We all know there is allot of potential in the 690. Let’s bring that out in yours! Tired of not being able to see on your way home? We all know that one of the weakest links in the 690 Enduro is the front headlight. 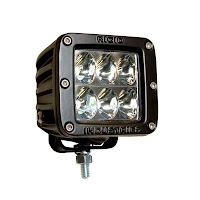 KTM thought it was a good idea to put a S2 bulb in that unit which is a 35wx35w bulb. That isn’t enough for all of the crazy night rides we all like to do. This X2 unit from KTM is just the ticket. Included in the kit is everything you need to mount this bad boy up. Included is a dash relocation bracket and all of the nuts and bolts to make it happen. For a few extra bucks we can get it with a Orange Shield for all you die hard KTM nuts. 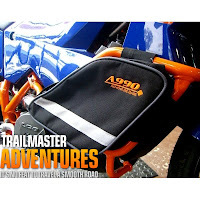 Trailmaster Adventures ingenious Crash Bar Luggage idea has come to KTMTwins.com. They are in stock and should grace every set of crash bars out there!